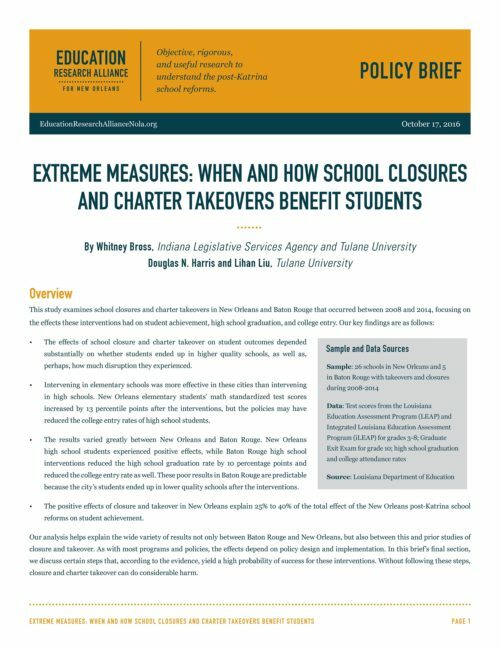 The effects of school closure and charter takeover on student outcomes depended substantially on whether students ended up in higher quality schools, as well as, perhaps, how much disruption they experienced. Intervening in elementary schools was more effective in these cities than intervening in high schools. New Orleans elementary students’ math standardized test scores increased by 13 percentile points after the interventions, but the policies may have reduced the college entry rates of high school students. The results varied greatly between New Orleans and Baton Rouge. New Orleans high school students experienced positive effects, while Baton Rouge high school interventions reduced the high school graduation rate by 10 percentage points and reduced the college entry rate as well. These poor results in Baton Rouge are predictable because the city’s students ended up in lower quality schools after the interventions. The positive effects of closure and takeover in New Orleans explain 25% to 40% of the total effect of the New Orleans post-Katrina school reforms on student achievement. Our analysis helps explain the wide variety of results not only between Baton Rouge and New Orleans, but also between this and prior studies of closure and takeover. As with most programs and policies, the effects depend on policy design and implementation. In this brief’s final section, we discuss certain steps that, according to the evidence, yield a high probability of success for these interventions. Without following these steps, closure and charter takeover can do considerable harm.